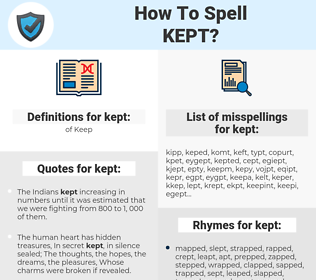 What are the misspellings for kept? What are the common mistypes for kept? What is the definition of kept? What are the quotes for kept? What are the rhymes for kept? What are the translations for kept? 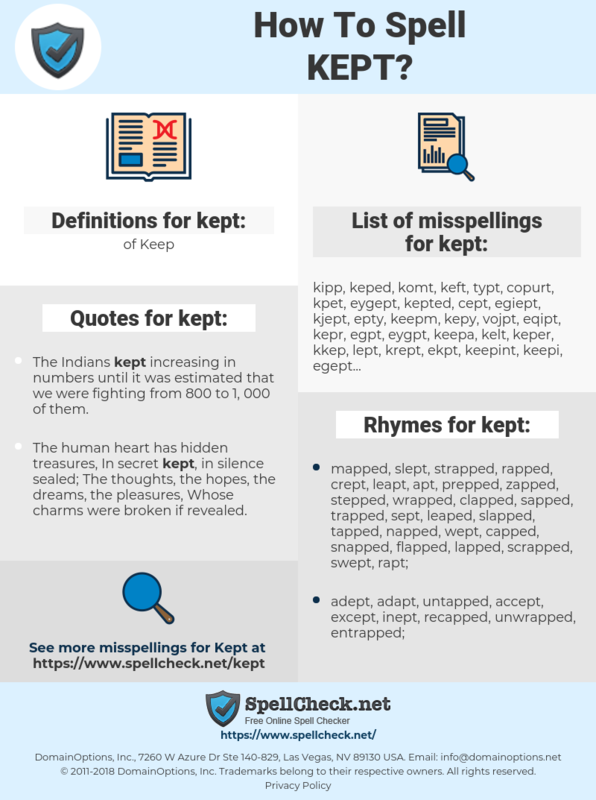 What are the common typos for kept? This graph shows how "kept" have occurred between 1800 and 2008 in a corpus of English books. The Indians kept increasing in numbers until it was estimated that we were fighting from 800 to 1, 000 of them. Children know from a remarkably early age that things are being kept from them, that grown -ups participate in a world of mysteries. So it's kind of nervous to be in this situation, but at the same time you look at all those actors and the work that they've done, I've been in bigger films than all of them and still kept my integrity and still kept my respect. If we had a hard time, my mother would sit me down and we would talk about it, and she kept talking and kept processing until we started to laugh about it. behalten, gewährt, gehalten, aufgehoben, aufbewahrt, abgehalten, reserviert, sich gehalten, aufgehalten, geblieben, ausgehalten, versorgt, zurückgehalten, genommen, freigehalten, fortgefahren, weitergemacht. mantido, detidos, armazenados, armazenadas, cumprido, colocadas, criadas, guardada, guardadas, arquivados, armazenada, cumprida, respeitados. mantenido, criados, cumplido, retenido, guardado, almacenado, continuado, guardados, conservados, conservado, conservada, mantenidas, elaborados, alojados.